1. Is the titanium so that it will not "burn out" the way a steel drum will burn right thru the metal? A> Yes, we have never had a stove bottom burn out... yet. 2. Is your stove air-tight, so the fire can be dampered down and kept all night long? A> No, not air tight. But you can damp it back and get 1.5 - 2Hrs burn time. This wood stove is interesting to me because of its design and total weight: 1 lb. 11 oz. 2" diameter, 12" long. Comes with 6.5' pipe for use in the Vertex 6.5.
to 2" diameter, 12" long. Comes with 8' pipe for use in the Vertex 8. Weight: 4lbs, 2oz with stainless pipe. 3lbs, 7oz with titanium pipe. 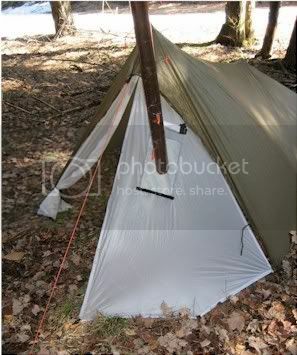 In Montana, I have seen "hunter's tents" utilizing a wood stove and "stove jack" with rain flap. I have seen wood stoves and tipi's advertised together, first, for me, at Kifaru. Kifaru, Ti-Goat, Tentipi and the Wyominglostandfound tipi pictured here are sold with "stove jacks" installed or will install the stovepipe port and rainflap. 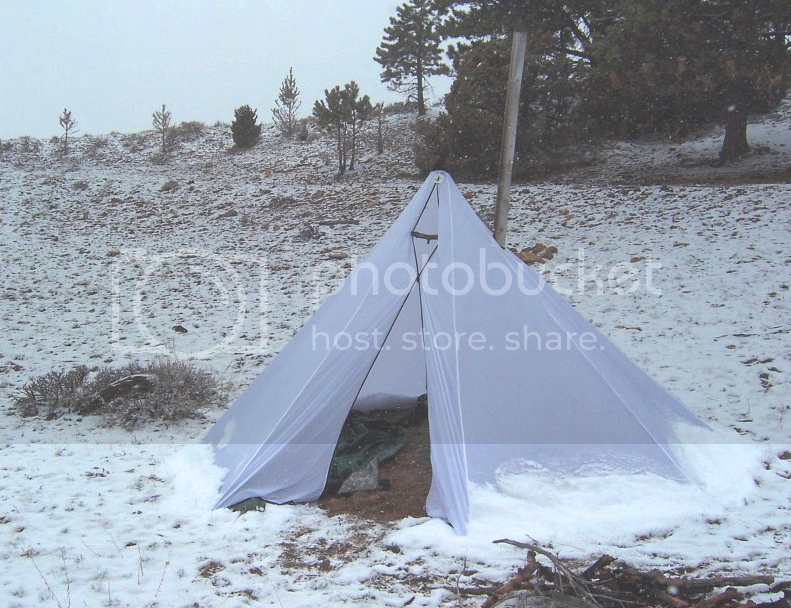 More tipis for backpackers are being offered, in addition to the Black Diamond Megamid and BetaMid Tents: MLD Mountain Laurel Designs DuoMid, SOLOMID, SPEEDMID, SUPERMID 2010, and TrailStar Shelter. Go-Lite has their Shangri-La 3 and Shangri-La 5. Neither Mountain Laurel Designs nor Go-Lite is showing their "tipi" like designs with wood stoves. Kifaru has their Shelter Accessories: Annex for the stovepipe, which may be possible to use with these other shelter designs. 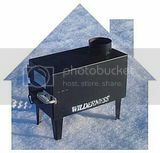 I already have a Wilderness "ice fisherman's" wood stove in a 16' "hunter's trailer". I already know how to use a wood stove. 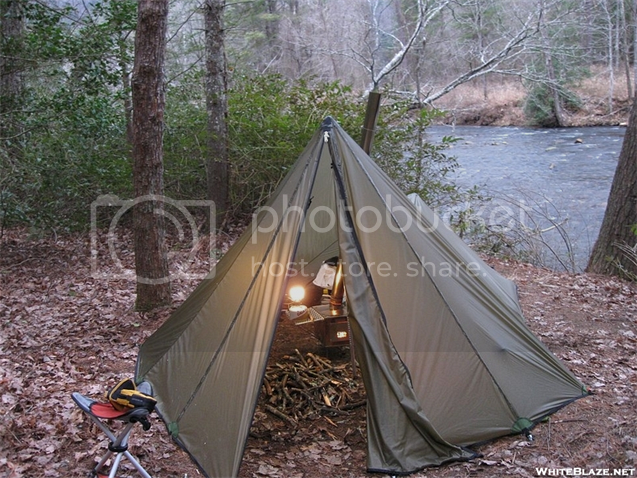 I am really interested in purchasing a small wood stove for a "hunter's tent". 1. What do you think about these wood stoves for time interval to resupply combustibles? 2. Do you think these wood stoves could be made air-tight? 3. Is there any likely owner-improvements, you see? 4. What stove do you think is the best selection for a 10-12' diameter tipi, like pictured first? 5. Is there a good tipi and stove combination you know? Opinions? Last edited by ConnieD on Mon May 31, 2010 4:43 pm, edited 16 times in total. it wasn't made to be broken down for any other reason than for transport to the cabin. it will be assembled, and set in a sand-pan in the cabin, never to be moved again. IIRC, the entire package weighed about 25 pounds. i think there is a possibilty that some of the commercialy available break-down stoves could be made air-tight. depends a lot on warpage of the material due to heat from the fire. Here is a small outfitters stove that weighs in at 15lbs. I believe the larger one is the stove that came with our outfitters tent. We have not had to use it ....yet. I have this stove in my 16' "hunter's trailer". I have this heater stove for my small home I want to build. The "packer's" stove is almost identical to the Wilderness "ice fisherman's" stove, I purchased from the Northern Tool and Equipment catalogue. I have that one in the 16' "hunter's trailer". I am not going to carry that out for a snowshoe in the mountains. I have a pulk, but it is only good for easy terrain. I have to carry my "winter camp". I don't need a wood stove for my small home I want to build. I don't mind admitting I wanted "double-duty" out of the stove: use for "winter camp" and use for small home as a backup to the propane Midnight Sun heater stove, because a backup is always good planning in remote places in Montana. That is the reason I am asking about dampering it back, at night, and making it air-tight. DarenN, That is a very beautiful stove. I see that your stove breaks down flat. Has it been setup out there, yet? Is it air-tight? Does it keep a fire through the night? I suppose "warpage" would be dependent of thickness of the stainless steel plate. But wouldn't titanium be inclined to have no "warpage"? i don't know if it has been set up yet. i know it was delivered to the bush pilot, but that is the last i heard. no. it's not air tight, but with the intake damper closed it shouldn't allow much air in. i doubt that it would burn all night just because of it's size (11x11x14). it just can't hold enough wood for it. i don't know enough about titanium to make a comment. that propane heater with the photo cells is a brilliant idea! I think the Wilderness stove I have is the small one 10 x 8.5 x 23 inches. It is not air-tight, as you can see it is riveted, and made from 16 ga. steel. I went to a wood stove builder, before I made that purchase. I asked him, if it was not properly made would he weld it, put in some firebrick, whatever it needed to be right. He said, put in the order and when you get it bring it to me. I did. He said that is a fine little wood stove. Find a damper for the stovepipe and let them put in the damper where you purchase it and the stove pipe, or bring it to me and I will install the damper in the stove pipe because it has to be just right. No one knew how, so he installed it and he had me put the first fire inside it outdoors. He said, the paint has to burn off the first time. I didn't even put that fireproof, fiberglass material rope using a tar-like adhesive for a gasket around the door. He used no stove sealant either. The Midnight Sun is more than interesting. I could "post" some of the better links. I have mentioned his product, and his projects, everywhere it might make a difference. I especially had fun making really annoying remarks with all the "green talk" no one has supported this, except in mainland China, up to that point. I have heard many people who want a natural gas version. I wish him every success. It is part of my life, to have people like him populate my life, present company included. OT: I am not at all convinced a wood stove need be air-tight to burn all night. I think the dimensions are most important for an effective wood stove, then, features like the wood ask sits on expanded metal, there is an ash drawer and there is a "shelf" in the back before the stove pipe are essential factors. I would really like to know more about a stove that can fold-flat, roll up the stove pipe and be transported, even only one time. It might help me understand these fold flat, roll-up-and-go portable wood stoves. 1. If inefficient, then high carbon-monoxide levels. 2. If short burn-time, no sleeping thru the night. Last edited by ConnieD on Sun May 23, 2010 10:07 pm, edited 6 times in total. Makes 100 watts continuously (actually more). The thermal power is 7kW. All from a small stove for a cabin or small home. His ir-spectrum gallium and antimony solar cells are on the space shuttle: my living-room and the space shuttle. I got one. The guy I got mine from had a prototype and did everything he could to steal from it. He even asked me what he could copy! Little did that guy know I have been a highly successful innovator in the same science and technology, in other fields of endeavor. That guy has it in pieces, and I laughed. I said, everything is from the hardware store and perhaps a plumbing supply. No doubt you can get them through your RV business. But everything that makes this run, is patent. But can I just change the jet, if I could get this apart, he cried, I would like to make it run on natural gas. Dr. Fraas says he is busy right now. I shook my head: that component is patent. He offered to sell it to me, and named a price. I said, I would have to save for months to have that much money! Many months later and $3,000, I purchased it from him. If not for anything else, to get it out of his hands. He lied, and did not send me the paperwork. His man broke the glass, putting it in my friends luxury car so it would have a nice bump-free ride home, but the glass was broken. I heard a "bad sound" when he put it in the trunk, but one of his employees distracted me, deliberately I feel, and his man who put it in the trunk insisted the glass was not broken. Of course it was. Everything about that guy, including his employees, was bad news. But I safely got Dr. Fraas' property away from that scoundrel. That is a lot of money, for me. But it was important. Maybe I should have this "post" in the section: Stoves With Character. Last edited by ConnieD on Sun May 23, 2010 1:40 pm, edited 1 time in total. 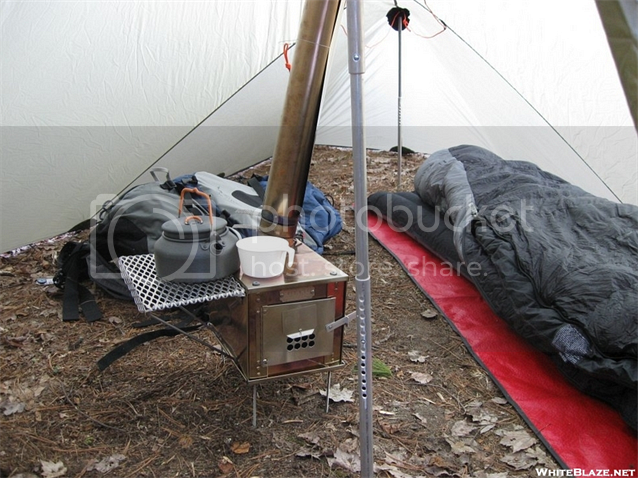 for a portable tent stove, i don't think you could go wrong with a Kifaru. their roll-up stove pipe is brilliant! they are a bit expensive, but, what price comfort? i based that s/s stove on the Kifaru, without ever having seen one, but for pictures. the "shelf" you mentioned i assume is what is called a "baffle". it makes the draft draw from the front of the stove so that you don't get a big puff of smoke every time you open the door. a commercial air-tight that i used to have had a system built in that drew the smoke away from the front so that the glass door wouldn't get all sooted up. you're right, a stove doesn't have to be air-tight to burn all night. it just has to be big. the stove in my cabin is not air-tight, but it is two feet square on the front and three feet long. it will burn all night easily, as long as i load it with birch. it's made out of 1/4" plate, all welded construction. it took four guys to get it into the shack, and that was before we lined it with fire brick! i built a stove for my workshop here out of 12gauge black iron. all welded, fire brick on the bottom only. it'll burn for eight hours. it's not air-tight either. My method of having an overnight fire is banking the fire with one cherry-wood log. Don't tell anyone. I achieve overnight burn in my Wilderness stove (10 x 8.5 x 23 inches) by adding-in a piece of thick tree bark. I have always thought volume related to BTU's and the size and volume of area to be heated. If size and volume of the wood stove are decisive, for an all night burn, what do you think is "best size"? Last edited by ConnieD on Sun May 23, 2010 2:15 pm, edited 3 times in total. i have no idea what an optimum size would be. i've never really thought about it. i guess it would depend on how much air leakage the stove had when close right up.